Larry Cathey navigates his Orange Torpedo downstream on a one-day trip through the wild section of the Rogue River. 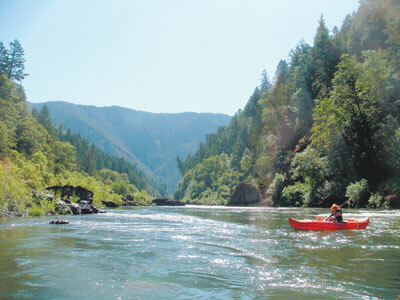 The wild section of the Rogue River, one of the most famous stretches of river in the United States, is usually a trip that takes three or four days. But on a sunny August morning, myself and Daily Courier Sports Editor Larry Cathey decided to try and finish the entire stretch in one day. It was a trip that neither one of us will soon forget. Larry Cathey looked across the boulder-choked entrance of Blossom Bar, the most infamous rapids of the Rogue River's wild section, with an expression that was both discouraged and defiant. There was reason for Larry's fatalism. His Orange Torpedo Tahiti had capsized in a hole guarding the entrance to Mule Creek Canyon just 20 minutes earlier, and he'd endured a calamitous swim through boiling whirlpools twisting and tossing him between jet-black cliffs. The sheer exhaustion of recovering himself in that unforgiving section of river had taken its toll. And as he stared into the teeth of Blossom Bar, a Class IV rapid where five people have died since 2007, his expression betrayed a person caught between fear and the need to exact vengeance. We watched a few rafts navigate the rapids before stepping into our boats and floating downstream, toward boulders that rise like a city skyline from the river. “Catch the eddy, split the rocks; catch the eddy, split the rocks; catch the eddy, split the rocks ...” played on an endless loop in my head as I visualized weaving through the Rogue's metropolis of stones, avoiding the dangerous Picket Fence and gliding safely downstream. It was the most dramatic moment of a trip that began in early morning at Grave Creek and ended in late afternoon at Foster Bar. In one day of sun and whitewater, fun and near-catastrophe, we ran 34 of the most famous river miles the West Coast has to offer. As I looked back at Larry, floating some 50 yards behind me, I could almost read his mind. More than 11,000 people run the wild section of the Rogue River each year, either as part of a commercial or independent group, and virtually all of them make the excursion a multi-day camping trip. The wild section is a place to be savored, a place that's graced the pages of national magazines and screens of Hollywood movies. Three- or four-day trips on the Rogue are something close to heaven. Estimates for how long it might take ranged from seven to 16 hours, and it wasn't until I talked to Erik Weiseth of Orange Torpedo Trips in Merlin that I received any encouragement. "It's definitely going to be exhausting, but I wouldn't say it's stupid,” he said. “You'll be really tired ... but it's doable for sure." Those magic words, “I wouldn't say it's stupid,” were all the encouragement we needed. The willingness to run the wild section is not enough in itself, of course. From May 15 to Oct. 15, a noncommercial float permit is required. If you didn't get one in the lottery, the most common avenue is to check the Bureau of Land Management's website for open spaces and call to reserve them. After I finally avoided the busy signal and got through, I struck out — all the permits for the Saturday in question were gone. But the next day I scored. After waking up at 8 a.m. and simply calling the office over and over, I connected and reserved two float spaces. There's nothing that compares with sliding onto the wild section of the Rogue River below mountains glowing dusty yellow in early morning’s light. After picking up our float permits from the Smullin Visitor Center at Rand, we were on the river by about 7:40 a.m., crashing into the baptismal rapids of Grave Creek and Grave Creek Falls before sliding through the narrow Fish Ladder chute around Rainie Falls. For the first couple hours, we were the only ones on a river that was deeply peaceful. Chinook salmon were everywhere, making their journey upstream. Their huge bodies rolled across the surface of the water at unexpected moments, breaking the silence of morning between the canyon walls. Those peaceful moments were few and far between, of course. There are 10 Class III and III/IV rapids during the first 10 miles, and we crashed across the waves and drops of Tyee, Wildcat and Black Bar Falls in such quick succession they blended into one long, wet roller coaster. As the river's canyon began to heat up — the weather called for sun and 95 degrees — we began to see more people. Above Horseshoe Bend, we passed a group of river guides preparing breakfast to the sound of classic rock. We floated into a commercial rafting trip a few miles later and made conversation with its occupants. “How many days are you boys on the river?” asked a friendly oarsman. “Well ... just today. We're trying to run the entire thing,” I said. He gave us a wave and said, “Well, good luck,” as though he fully expected to see us marooned, starving and shivering together later that night. The river picked up below the Rogue River Ranch and tiny outpost of Marial, and we came face-to-face with the dark gateway of Mule Creek Canyon. The jet-black cliffs swallowed our boats into a crevasse so deep and narrow it felt as though the river dropped underground, and we were floating through a subterranean labyrinth. The water boiled and pulsed, folding back upon itself through a current that seemed intent on whipping us into the walls. Ahead I saw a frothing hole on the left and strained my arms just enough slide past safely. He nailed the hole straight-on and his boat flipped. He clung to his backup paddle and boat through Coffeepot Rapid's whirlpools that sucked him down and back up like a human bobber. Downstream, we corralled his gear into an eddy and took inventory. Water and food? Check and check. Just downstream, Blossom Bar laid in wait. The thrill of gambling, I've always believed, isn't the large amounts of money being wagered. The addictive quality of gambling — what drives people to the tables and holds them hostage — is the few moments before the card is flipped over or the dice stop rolling. In those moments, the mind is so enraptured with anticipation that nothing else matters in the world. It's a powerful sensation, and the only other place I've felt that intensity of focus is above Class IV rapids. All of your adrenaline is distilled into the strokes you'll need to make during the next few moments. There's no escape, no backing out, and everything else fades far, far away. At Blossom Bar that focus was upon one crucial move. As I entered the city of boulders, I paddled hard into an eddy and moved left-to-right across the frothing face of the Picket Fence — a jagged collection of rocks known for trapping boats and people — before sliding down a smooth tongue of water into the less threatening waves below. As I swung left around the massive Volkswagen Rock at the rapid's bottom, I turned around in just enough time to watch Larry navigate the rapid with professional smoothness. The most challenging section of whitewater was behind us. We'd paddled more than 20 river miles and it was only 1:30 p.m. The afternoon would bring hot temperatures and amazing scenery, and for just a moment I allowed my shoulders to relax. Just in time to go tumbling down the Devil's Stair. Whether it was laziness or exhaustion, I failed to give the final Class III waves their proper respect and was unceremoniously tossed from my boat. After flailing around like a confused animal, I managed to flip the boat right-side up and jump back in — a wonderful aspect of Orange Torpedoes — and hope for just a moment that Larry didn't see the performance. There's a harsh truth to face about the final section of the wild Rogue, and that's the return to civilization. Jetboats roar upriver from Gold Beach, the water slows down and the number of drunk raft passengers increases tenfold. We watched a small black bear roam the river's shoreline with a jetboat full of people parked right next to us. And as we began paddling past rafts in the slow water, we even got heckled a few times. “Oh, look at us, we're tough-guy kayakers,” shouted a drunk and shirtless raft passenger. We were, in fact, tough-guy kayakers, at least in comparison to those catching an easy raft ride. The time passed, and as the sun began to drop into the golden hour, Larry and I found ourselves slouched down in our Orange Torpedoes, barely able to move our arms to paddle. We'd been on the river for almost nine hours, and around each bend, we hoped for the boat ramp of Foster Bar. Soon our prayers were answered, and we dragged our boats from the river with weary arms. In one day we'd survived 34 miles of whitewater and the wrath of Blossom Bar. The wild Rogue River is a place to be savored, a place where three- or four-day camping trips are something close to heaven. Well, the only conclusion I reached was that I’d never, ever do it again ... until next year. This site Copyright © 2019 Grants Pass Daily Courier/Courier Publishing Company.